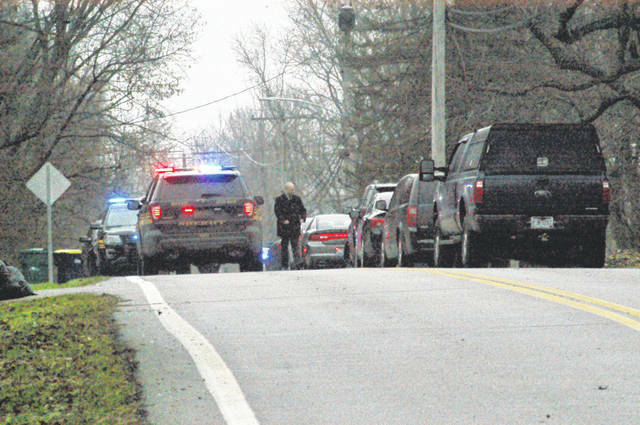 N. Diamond Mill Road was blocked off following a police pursuit that ended south of U.S. Route 40 early Friday afternoon. A suspect fired shots at the Clay Twp. Police Department and fled east into Clayton. After the pursuit the suspect exchanged gunfire with police and was wounded. CLAYTON – A male suspect allegedly approached and fired shots at the Clay Twp. Administration Building, which also houses the police department while police officers were inside early Friday afternoon. According to Chief Deputy Rob Streck with the Montgomery County Sheriff’s Office, a car pulled up to the Clay Twp. Police Department and began firing shots at the building. When officers came outside to investigate and ordered the suspect to drop his weapon he fled with police in close pursuit. Officers pursued the suspect through Clay Twp. and east into Clayton. The suspect ran over a tire deflation stop stick placed in the roadway by the Ohio State Highway Patrol on N. Diamond Mill Road south of U.S. Route 40. The suspect exchanged gunfire after the pursuit ended. He was wounded by police and transported to Miami Valley Hospital North for treatment. His condition is unknown. After the shooting at the Clay Twp. offices several jurisdictions responded to lend assistance. The ATF arrived at the termination point of the pursuit to investigate. According to an un-named source, the suspect allegedly had a loaded semiautomatic assault weapon, possibly an AK47, on the front seat of his vehicle and was an individual police had dealt with in the past. Northmont City Schools said on its Facebook page the high school and middle school were both briefly placed on lockdown during the incident.